Investissement avec un biais "Value" et petites capitalisations. Value and small caps investing in France. My portfolio is down 11% in 2018 (incl dividends). I've been somewhat protected from the general underpeformance of French small caps by a large cash position (I was finding everything too expensive last year), but it's still painful. My cash position is still about 30% end 2018. The positive aspect is that the market is less boring now, with more opportunities (some details below). Makes industrial scales and associated services (calibration...). The business is slowly expanding its operations and making small acquisitions. Down ~20% for no particular reason. See my original blog article here. The auto parts manufacturing branch has been sold last year, what remains is the pump business, currently priced at a negative EV (market cap is 137 m€ for a net cash of 165 m€). However end 2017 there is a 65 m€ in "advances received from customers" in the balance sheet that I don't understand (why such large advance payments ?) and maybe should be deducted from net cash. 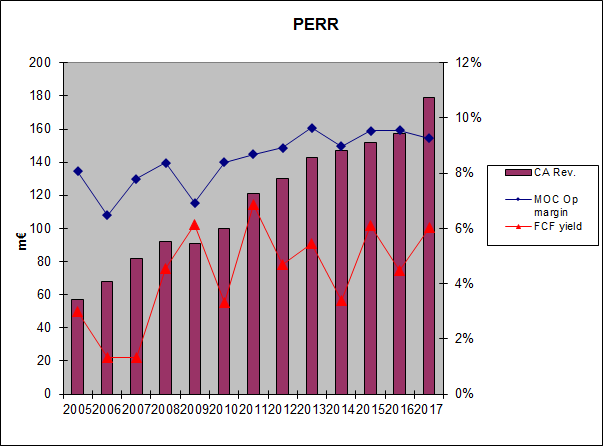 Taking into account this correction, a 9% "historical" median margin on 90 m€ sales, the valuation is still low EV/EBIT ~ 3. See "value and opportunity" article here, or "back of the enveloppe investing" article here. Assuming a 10% decrease in results (latest guidance), EV/EBIT ~ 5 at current price. In 2018 the "gold" branch CPROr was sold to Loomis, however the transaction was only approved by the authorities last week so will not be finalized in 2018 accounts apparently the sale was completed dec 31. 2018 HY accounts were relatively surprising (for me) : net debt went from -15 m€ end 2016, to 34 m€ end 2017 and 126 m€ mid-2018. Lots of acquisitions, accounting movements due to the CPROr sale (large part of cash was reclassified in assets to be sold). I've sold part of my position after HY results, waiting for the dust to settle to reconsider. Probably the largest negative impact on my portfolio this year. Micro-cap, malt for beer brewing, French and East-european markets. I was writing end 2017 that "It is likely that the main shareholder (Groupe Soufflet) will buy out minority investors at some time" and it did happen a few weeks ago, at around 11x2018 EBIT. Not a very generous offer, but the stock will probably be delisted in 2019. See my blog article here. I was writing end 2017 : "No longer cheap , I'm beginning to get nervous after the stock price increase, but good recent results and growth make me reluctant to sell. When should a stock like this should be sold ? When reaching unreasonable valuations ? When results start to degrade ?" Results are quite good, and valuation still reasonable. I guess that the market anticipates a recession for these cyclical companies, some defavorable impact of the transition to electrical vehicles (much less parts), and the impact of trade wars ("Trump" effect). I've cautiously started to buy some shares of Akwell. - specialized in equipement for fluid management in cars (air, fuel, coolant,...) : likely to be impacted if there is a strong switch towards electric vehicles. I don't see that happening very quickly, but I may be mistaken. Some electric batteries need to be cooled anyway. 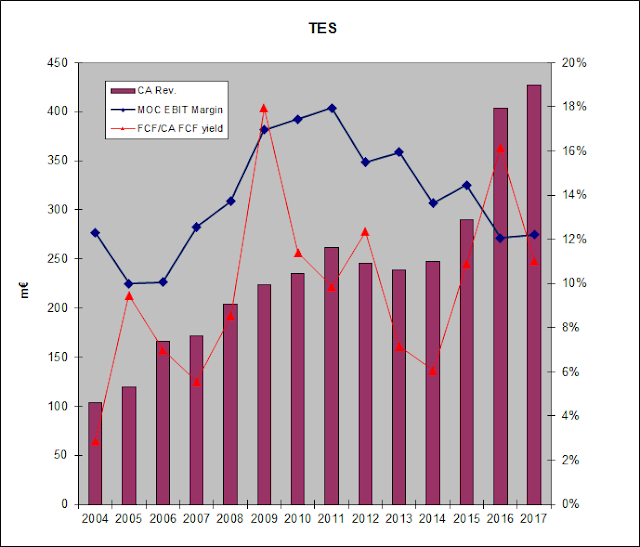 The stock currently trades at 4x2017 EBIT ( and 10x the average EBIT of the last 13 years). I think the safety margin is sufficient, but I'm staying very cautious at this stage. In 2018, there has been numerous articles and official criticisms (along the lines : no scientific proof of efficency compared to placebo effect) about homeopathy in France, with persistant rumors about social security stopping reimbursement. This may impact Boiron sales (about 40% of revenue if I understand correctly) but I think that "believers" will continue to buy nonetheless (the pills are quite inexpensive anyway). - temporary staffing sector (groupe crit : -30%, synergie -50%, groupe dlsi -35%) : they all trade at 3 to 4 times 2017 EBIT. The market anticipates a recession, and maybe the impact of some French fiscal changes. - housing (promoters and indivual home construction) : Maisons France Confort (MFC), AST groupe (ASP),... same story a strong contraction seems to be anticipated by the market. For net-net amateurs, Passat (PSAT), Exacompta (EXAC), Signaux Girod (GIRO) trade under their net current asset value. The blog reflects my portfolio activity...I currently find few investment opportunities fitting my criteria (cheap valuations and reasonable quality companies), so I do nothing. I've mainly trimmed down some positions, and I'm now around 17% cash. My portfolio is up 20% in 2017 (incl dividends), carried by the rising tide of valuations. Makes industrial scales and associated services (calibration...). The business is slowly expanding its operations and making small acquisitions. Still reasonably valued, should benefit from improving French economy. See original article here. Still reasonably valued. See value and opportunity article here. Still reasonably valued. See my original blog article here. Interestingly the auto parts manufacturing branch has been sold this year, at around 0.8 price to book value. What remains is the pump business, which historically has been more profitable, requiring lower maintenance CAPEX, and a large pile of cash. What management (indifferent to minority shareholders) will do with this cash remains the central issue. See my blog article here. No longer cheap , I'm beginning to get nervous after the stock price increase, but good recent results and growth make me reluctant to sell. When should a stock like this should be sold ? When reaching unreasonable valuations ? When results start to degrade ? See article here. Some funds have stated that the price offered by Schneider is too low and are betting on an improved tender offer. Constuction sector, in France and overseas territories. One of the 1st stocks I bought a decade ago. It was a net-net then, it is still very cheap now. All the markings of a value trap, 2017 results rather bad but does not burn cash. Large cash cushion. Value investing may involve patience but in this case it is rather extreme. Time will tell (maybe). Micro-cap, malt for beer brewing, French and East-european markets. Used to be extremely cheap (taking into account unconsolidated results from the east-european factories), still reasonnably valued now. It is likely that the main shareholder (Groupe Soufflet) will buy out minority investors at some time. Very illiquid stock. Well 2016 is not finished yet but I do have some free time now. My portfolio is up 22% vs 15% in 2015 (11% in 2014 and 35 % in 2013) (internal rate of return, including dividends and broker fees). - Independance et expansion up ~27%. Noteworthy : the fund may be closed to new subscriptions next year to limit its size. A good performance, mainly linked to my investment universe rather than my stock picking skills I fear. The downside is that I find fewer and fewer investment ideas. Tessi. The founding family sold its majority stake mid 2015 at 132 €/share to the Dentressangle family. A tender offer will be made at the same price early 2016. The stock is currently around 150€ and valuation is still reasonable. I don't intend to sell my shares. Precia. Makes industrial scales and associated services (calibration...). The business is slowly expanding its operations and making small acquisitions.Still reasonably valued. Gerard Perrier (industrial automation, nuclear sector, should benefit from EDF "Grand carenage" program = major maintenance and upgrade of power plants to extend their lifetime). 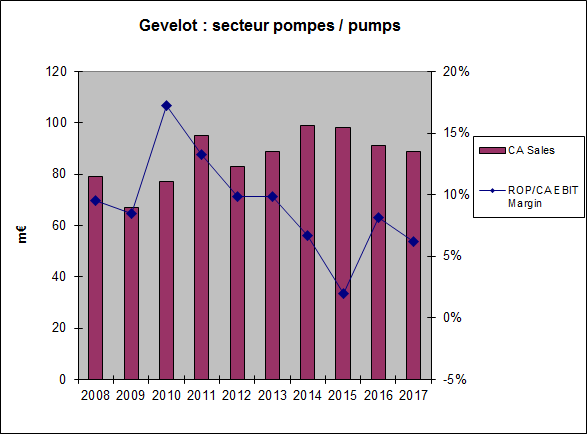 Gevelot (auto parts, pumps). Flat this year, suffers from downturn in oil sector. Very cheap (around 3x EBIT) but management seems firmly decided NOT to return excess cash to shareholders. SII. Up 74% this year after 70% in 2015. Textbook revaluation (from low earnings/low multiple to higher earnings/higher multiple, Mr Market loves growth). DLSI (interim staffing, comparable to Group Crit but smaller company). Up 80% this year, economic situation slowly improving and construction/building sector in better shape, benefits also from tax rebate for low salaries (CICE). ITS Group (IT services). To make a long story short, I was assuming that after a major acquisition in 2013 profitability would be restored at the level of comparable companies. Apparently takes much longer than I anticipated based on management announcements. Rallye group (holding company of supermarket chain Casino, operating in France and Latin America). I was lured by the juicy dividend, got hammered after Muddy waters shorted the stock (link). Too complex for me to be really sure of myself, sold some at a loss to reduce psychological stress to manageable level. Not so convinced about Muddy waters thesis though. Best wishes and hope to write more next year. The AMF has decided (April 06) that a tender offer is not mandatory and made an answer to CCI holders : link (in French, no official translation available). Independent experts (Cabinet Ledouble, Duff&Phelps, Accuracy) have estimated that the transaction is fair. Strangely enough their reports are not available on the AMF website, which is usually the case. In the last paragraph, the AMF makes an allusion to the next move made by Colette Neuville from the ADAM: sue the regional banks (see article here, in French). Apparently the angle of attack is : CCI holders are entitled for a share of the net assets upon liquidation of the company, CCI are emitted for the lifetime of the company, and the lifetime of the company is unlimited. Basically the argument is that such an unlimited contract is illegal. The ADAM will 1st make a formal request to the banks to buy out CCI shareholders who request it, then sue each regional bank if necessary. The ADAM offers to small individual investors to do it for them, in exchange of a small fee to cover expenses. I'm not competent to judge the chance of success but it's a situation with little to lose and a 3 bagger in case of success. Latest news from ADAM argumentation: see article here (in French). Besides they encourage individual shareholders to directly contact the AMF which I've done. 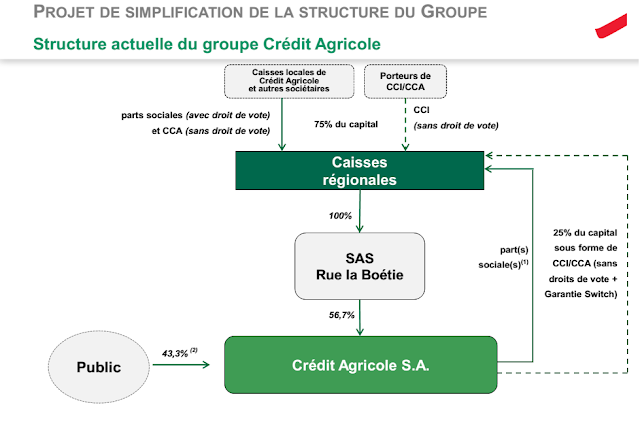 If you screen the French stock exchange, you've probably stumbled on the Caisses Regionales du Credit Agricole. There's about a dozen of them (tickers : CRAP (! ), CCN, CRTO, CNF, CAF, and so on...). They trade at ridiculously low P/B and low P/E ratios. I've owned some shares for several years now. 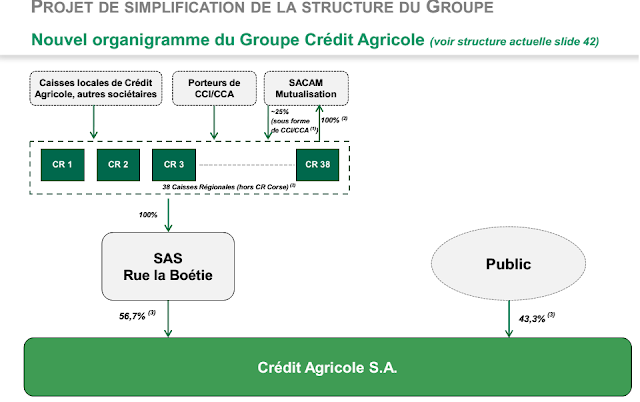 They're currently under the spotlight because Credit Agricole intends to "simplify" its structure ; however this simplification is also the occasion to shaft minority shareholders, as I'll try to explain. I don't know what can be done about it, but I'll try to summarize current local events for non French-speaking investors. For a general introduction to these banks and the investment thesis, see this article (page 54) by Paul Issac of Arbiter Partners in the spring 2013 edition of the Graham and Doddsville newsletter. I'll rely heavily on this article. It'll save me time and be clearer than my own dubious english. companies, the asset management division, and about 25% of each of the regional banks. 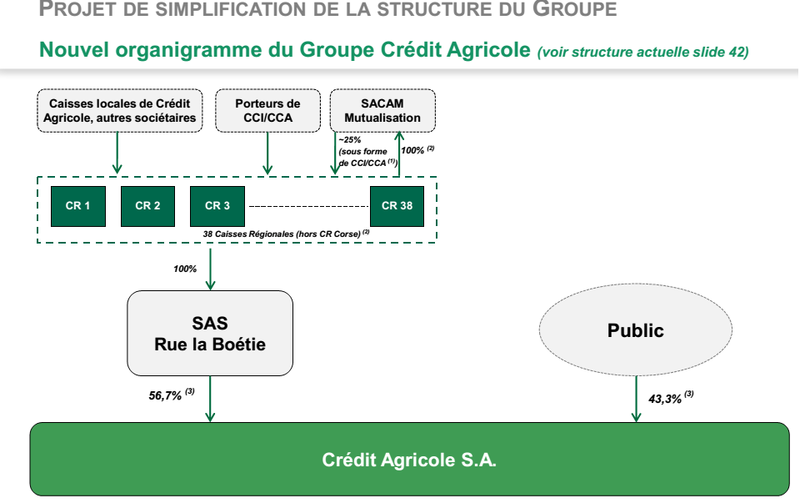 added personal note : Crédit Agricole vehicle, which also gets involved in all kinds of things big banks do, like investing in Greece at the worst possible moment (6 bn€), fooling around with derivatives (anybody remember Jérôme Kerviel ?) ... while the regional banks main activity is local lending, not very exciting but much safer I guess. holding in each of the regional banks owned by the corporate and investment bank. - CCA These are the shares owned by CASA in each regional bank. Generally the CCA represent 25% the a regional bank capital. These shares are not listed. - CCI These are the listed shares you can buy on Euronext (see tickers above). Most are illiquid, but not an issue for an individual investor. These are non voting shares. - PS or Parts Sociales. These are the only voting shares issued by each bank. They are owned by the local banks but also by the clients. They have a fixed nominal value, and get an interest each year. Parts Sociales are a strange mix between a bond and a stock. But it's clearly not debt. The annual report says : "Conformément aux dispositions de l’IFRIC 2, la qualité de capital est reconnue aux parts sociales des coopératives dans la mesure où l’entité dispose d’un droit inconditionnel de refuser le remboursement des parts"
"according to some obscure for me accounting standard, the PS are part of the bank capital, because the bank can unconditionally refuse to reimburse them". Well, it doesn't make much sense to me, but that's it. CCA = 25 % of capital, CCI ~ 10 % of capital, the rest is PS. These entities are trading at five or six times earnings. They're paying dividends of five to seven percent. Most of them have buyback programs. There have been buybacks of whole share classes of these entities. When they've occurred they've been at significant premiums to what these are currently trading for. 2 Regional Banks (Aquitaine and Centre Loire) bought out their CCI shares in 2009. The offer was about ~75 % of book value. The details of the operation can be found on the AMF (French SEC) website. outstanding indefinitely, and we may get some buybacks of whole issues. the regional banks will NOT make the same offer to minority investors. It is an "internal transfer operation" only ! Obviously minority investors (including me) are not pleased at all (article from Les Echos here, Investir journal here), in French only. Some well-known local value funds are stressing the inequality in the treatment of shareholders (not exactly shares, because CCI are non-voting shares): Amiral Gestion, HMG Finance, Moneta Asset Management, Financière Tiepolo, but also our friend Arbiter Partners, Invesco and some others. They have contacted Collette Neuville, a well known advocate of minority investors (association for the defence of minority investors, ADAM). I've done likewise, I don't have the legal backround to argue my case and I suspect that the legal status of CCI shares is probably very special. My portfolio is up 15% vs 11% in 2014 and 35 % in 2013 (internal rate of return, including dividends and broker fees). I draw no conclusions from this year underperformance, given the noise/randomness component that affects these results. Tops: SII (see my 2014 article), up 70% this year. FFP had a good year also, following the recovery of Peugeot. Flops : ITS Groupe (ITS), down 15%, company in the same sector as SII. I'll make an article on it because I've not given up yet on this idea. Generally speaking, I find relatively few investment opportunities at the moment. I'm thinking about opening an account at an international broker (Interactive Brokers ? any feedback ?) to widen my investment horizon at a reasonable cost but the amount of taxes paperwork required by the French administration for an international account makes me hesitate. CNIM (ticker: COM): too good to be true ? CNIM has released yestersday its HY2015 results (in French only, for the moment, but CNIM has an english version of its website). HY results are good and valuation is rather attractive on the basis of trailing earnings (EV/2014 EBIT ~ 4). Stock is up 5% in 2 days, notwithstanding Monday declining overall market. However I'm not convinced that the valuation is so attractive, considering the outlook, and would prefer a larger margin of safety. 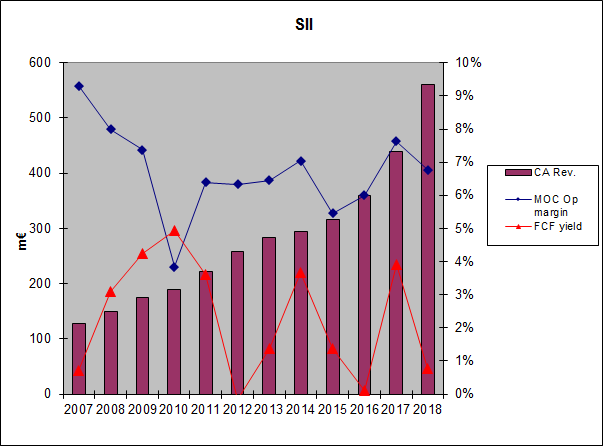 The stock currently trades at a low valuation (76€ when article was written, EV/2014 EBIT ~ 4, ~7% dividend yield) and shows a good historic record of profitability. Strong balance sheet (excess cash 46 m€). FCF varies a lot because of the changes in working capital requirements linked to the construction contracts payment terms. Why is it cheap ? Is it a real undervaluation ? Link to value and opportunity recent post on the exact same topic : "Cheap for a reason". CNIM is not followed by any analyst , as far as I know. However, liquidity is reasonnable. CNIM is not a "micro-cap" at least on French market standards, and I think that some small cap/value funds are certainly well aware of CNIM. "Systems" activity suffers from governement budget cuts. Among other things, CNIM makes landing barges for Mistral-class military ships. I'm not sure if the cancellation of the Russian purchase has not affected indirectly CNIM. Business journal "Les Echos" made this summer an article (in French) on technical unemployment for 510 people (2/3 of the total) in some CNIM plants (mainly in the "systems" division) due to reduced activity. Translation of the title: "CNIM group suffers from an unprecedented reduced backlog in defense and environment". What bothers me is the environment sector, the only one making serious money currently. I've made some (not enough) research on the WTE market. An article from Johannes Martin of Martin GmbH which supplies key components (moving grates on which the waste is burned) and a long-time (50 years) industrial partner of CNIM. We'll get back to Herr Martin later. Summary: saturated market. British market was strong recently. Another article from "Waste management world"
Explains that EU law on landfills (higher standard for landfill sites) is the driving force behind the construction of WTE plants. Overcapacity in Germany and Northern Europe (some countries import waste to be burned! ), dynamic UK market, some distant prospects in South/Eastern Europe. Some perspectives on modernization of old units. I've noted that recent CNIM contracts for WTE plants are in the UK so it is consistent with this article. The article also states that southern Europe (including France) "have not yet involved into major markets for WTE" but this is inconsistent (at least for France) with this 2012 map of european WTE plants. This presentation from J. Martin is also intersesting and gives a worldwide perspective (warning: 8 Mo pdf file). Scuttlebutt: I currently live not far from Marseilles. The implantation of a much-needed waste incinerator has been met with a fierce opposition from local associations and associated legal battles (NIMBY syndrome). In the above article of "Les Echos", it is also noted that CNIM had been awarded the contract for the modernization of a 40 year-old WTE plant in France, but the contract has been suspended after locals have opposed it. So to sum it up my interpretation is that the recent good results for CNIM are mainly linked to the UK WTE market, and that it is not reasonnable to extrapolate these recent results. Some major shareholders sold their share, including Martin GmbH (10% of capital) and CNN, a shipowner company (20%) previously associated with CNIM. So CNIM is now fully controlled by the Dmitirieff family. I've found no explanation why Martin GmbH or CNN sold their shares. So I must conclude that the price offered was judged fair by these sophisticated investors, and the current price offers no discount. The tender offer documentation is available here (in French). - "fair value" (DCF, comparables) : around 125 € (before 30 € special dividend), so around 95€. This figure means little by itself, but I guess it offers some kind of "protection" against a lowball buyout. 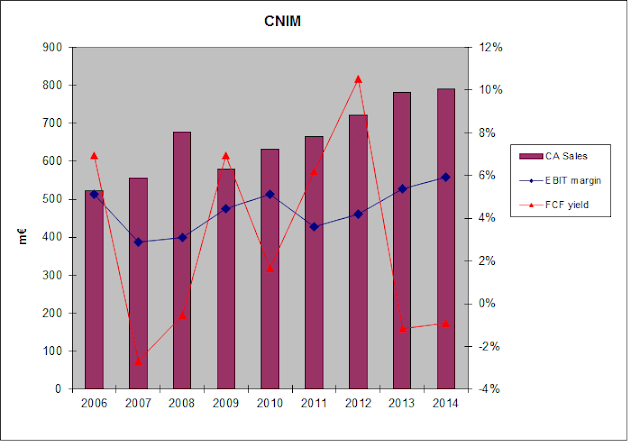 CNIM has released its HY 2015 figures yesterday. Backlog is somewhat better compared to end 2014. Sales are down compared to HY 2014 but operational margin is suprisingly good (8%). CNIM offers no guidance, other than "orders will be in progress in 2015". CNIM stock went up ~5% as a result. What kind of earnings can we expect. CNIM is not selling coke bottles or candies, but is mainly a contract-based business so predicting future activity is fraught with uncertainty, and as we've seen the outlook is not so rosy. Based on baklog orders and HY figures, I think it is reasonnable to expect around 720-730 m€ sales. I'll use a relatively conservative hypothesis of 5% operational margin instead of the 8% operational margin of the 1st HY 2015 which I don't really understand (the full HY report is not yet available). I get a "normalized" EBIT of around 37 m€, and a EV/EBIT~ 6 (EV taking into account net cash 46 m€ from the 2015 HY report and 27 m€ retirement liabilities, no correction for negative working capital*). Not expensive, but not dirt cheap either. I'll wait for a bigger margin of Safety (if it comes !) before adding to my existing position. Anyway I hate chasing stocks when they go up and prefer to buy on dips. *One point that bothered me is that CNIM benefits from pre-payments from the client on its contracts and shows a significant negative working capital (for instance almost ~100 m€ negative working capital in 2012). I was unsure about how to account for this excess cash in the EV calculation . However this negative working capital is only 7 m€ in 2014, so I neglect it. - low valuation but the easy money has been made ? They have posted several videos on youtube about the production sites (plants in France and Germany). So it's industry, presses, cold forming, heat treatment, machining and lots of CAPEX. Apparently their technological specialty is PCP pumps, used for instance in oil and gas. PCM was founded in the 1930's by the inventor of PCP pumps. Division sold at a loss in 2014. 2) Why is it cheap ? Gevelot owned a 45% stake in Kudu, a canadian pump supplier using this same PCP technology. Gevelot bought the remaining 55 % from its main shareholder, and sold it right back in 2013 to Schlumberger. Kudu (45%) was valued at 10 m€ in 2012 Gevelot books and Kudu (100 %) was sold for 168 m€ to Schlumberger. Nate at oddball stocks made an article about it in 2014. 3) Where will the cash go ? Not in the minority shareholders pocket for sure. No special dividend, no announcement for a major buyback program. There's not even an increase in the usual dividend. The company has a modest share buyback program running though. - acquisition of AMIK Oilfield Equipement and Rentals (Canada). I'm not sure it's the best timing given the evolution in oil/gas prices but I'm not an expert and I don't know if the price paid is right. The capital is entirely controlled by the family. A notable shareholder is the fund "Stock picking France", with a deep-value style. Another fund present at the capital is William Higgon's Independance et Expansion fund, that I've mentioned in some previous article. However these funds have bought a long time ago and at a much lower price (years ago for the 1st one). 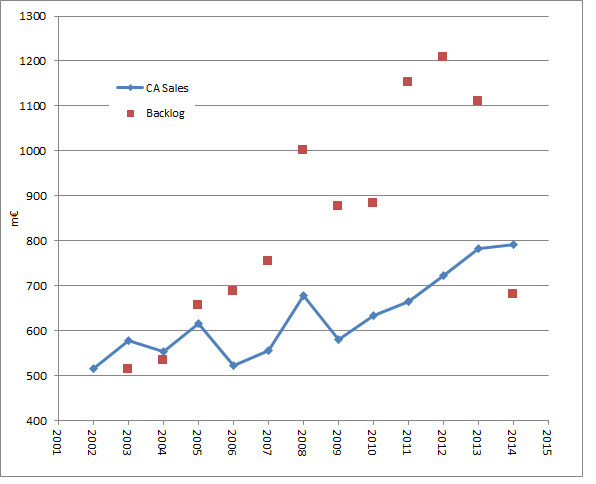 All figures (sales, results) are excluding intra-company transactions (more on that below). The extrusion division is certainly not a "great" business: no competitive advantage, cyclical, heavy CAPEX, about 4-5% average (median value in the above table to be precise) operational margins. The outlook for the car industry seems recently better than the very difficult post 2008 years though. The pump division has better margins (~10 %), less CAPEX requirements, but I've been unable to find the contribution of the oil/gas sector. Given the recent slump in oil prices, I wonder how to normalize earnings to account for the oil investment cycle. I've tried a sum of parts valuation, but one point that beats me is intra-company transactions (see table below). Just adding the estimated value of the extrusion and pumps branches without taking into accoung this internal transactions (-3 m€ in 2014) would lead to an overvaluation. 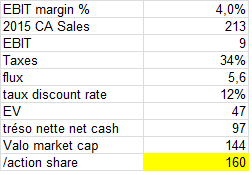 To get some idea, here's a very simplified DCF calculation, with conservative assumptions (no growth, average 4% margin, 12% cost of capital). So yes Gevelot is cheap, but operates in a difficult business with no competitive advantage. The lack of liquidity, and indifference to minority shareholders probably explains some part of the discount. In any case it will take patience to see if the excess cash is used wisely and will produce results. Given the recent historical performance I doubt the return on this capital will equal its cost for a company like Gevelot. Link to a very recent relevant article (Investing in bad businesses Damodaran).